Nothing can make a child’s party come to life in the way that an inflatable bounce house can. The inflatable rental industry has really taken off in recent years and more and more individuals splurge on this luxury for their children. The joy and excitement that inflatable bounce houses and castles can bring is unparalleled. However, making your inflatable rental business more profitable is all about investing in mobile solutions. Mobile solutions have the ability to add convenience for all parties involved. Why not find out what mobile solutions can offer your inflatable rental business? It is no secret that your business is mobile and almost always on the go. This means that you need access to mobile solutions designed to help add higher levels of customer satisfaction. Since your business is always on the go, mobile is the only way that you can bring consumers more awareness. Know you can increase the levels of communication with your customers by letting them know specific time of delivery and arrival. This allows them to know exactly when to expect you and takes all the guesswork out of delivery. Giving your customers access to more information only helps to make their experience with your inflatable rental business more appealing. As a mobile solution, EquipCalendar is here to increase levels of communication with consumers. Mobile solutions for your inflatable rental business will also help you to keep a closer eye on your inventory. EquipCalendar manages your inventory and allows you to make the most of your resources and to keep your customers happy. You should know that inventory management is greatly improved with the use of a calendar to track inventory at all times. This allows you to know exactly where your inventory is and enables you to know the time periods that are the busiest. Overbooking will be a mistake of the past if you finally decide to invest in mobile solutions such as EquipCalendar for your inflatable rental business. Owning a business that is always on the go is not an easy proposition, but now you have access to tools that are designed to make everything much simpler. 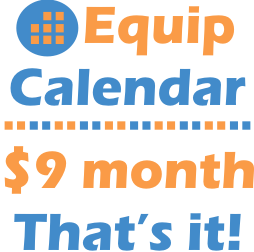 EquipCalendar is an affordable mobile solution and a great way to offer levels of customer satisfaction that you never thought possible.